Stained Apple Crates - Colonial Trading Co. 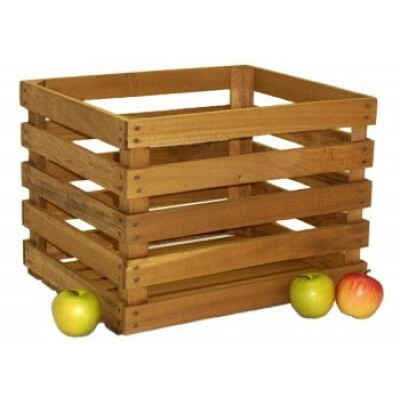 These Stained Apple Crates are made from locally sourced Eastern Pennsylvania Poplar wood. The logs are cut locally and we air dry the lumber. The slats are fastened with a full round head steel nail. We stain them with Minwax Golden Oak stain, which gives them a more finished look and protects them somewhat from weathering. 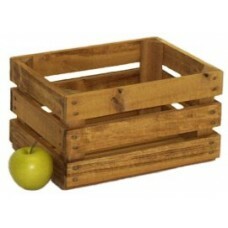 These are very solid crates and will hold a considerable amount of weight. 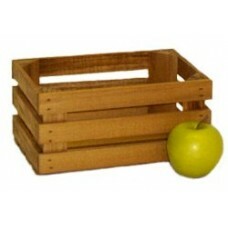 They are fashioned after the crates used in local orchards, but have many different uses in your home or business. They make great supports for shelving, or just stack them for tons of storage. Use as end tables, or simple storage. Construction is solid Poplar, with 3/8" thick x 1 1/2" wide slats, and a triangular brace in the corners. 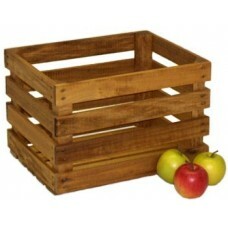 Please allow a couple of extra days for these to ship, since we usually stain the crates per order. Note: Contact us for discounts on large orders We can also build custom sizes (may require a minimum order quantity).